32 degrees Celsius in the shade, and it’s snowing?! This is not a flaw in the system of elements nor due to global warming. This happens exactly when Eisfabrik enters the stages of this world. 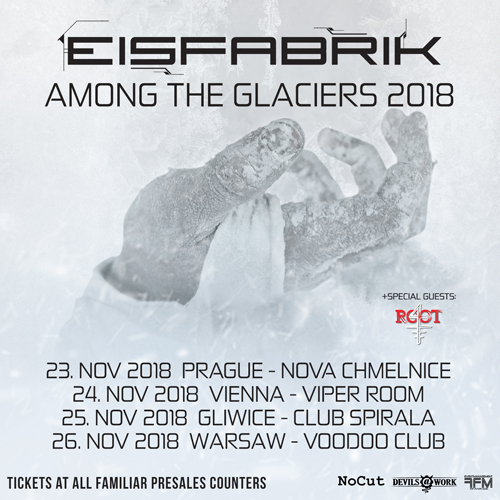 Eisfabrik is an art project with integrated characters as protagonists and should be regarded in its overall concept, not just as a project, but as an independent band. The three Eisfabrik protagonists are Dr. Schnee, Frost and Celsius. Musically, the band fluctuates somewhere between dark electro and future pop, being also quite open to venturing in other directions of electronic style and integrating this skillfully into its sound. Especially catchy and cool harmonies are the focus of Eisfabrik. Since this is an overall artistic concept, the visual factor also plays a big role. Thus, numerous individual effects and show acts become important during live shows. During the performances, the band plays with innovative lighting effects on stage as well as on the protagonists themselves. When an approximately 7.5-foot-tall robot, a snowman or yeti storms the stage while the band is giving their best or, as mentioned above, it begins to snow during the performance, all of that is part of the current program, too, as is the band’s name that is distributed in DMX mode over the entire stage. The current album “Achtzehnhundertunderfroren” marks the next step for Eisfabrik. Third album, third position in the German alternative charts, first own headliner-tour – and – not further surprising: Success, wherever you look. With that the band filled renowned clubs all over Germany, the press and fans simultaneously cheered and thus the path for “Null Kelvin” is paved.